Crime fiction and thrillers aren’t my preferred reading, so I’ve never been tempted to read a Jo Nesbo novel before. This would no doubt have remained the case had I not been curious to see how he would retell my favourite Shakespeare play, Macbeth. Nesbo sets his story in Inverness, making it sound almost like a Scottish version of Gotham City. In Nesbo’s Inverness, bike gangs, drug lords and corrupt police rule. Nobody knows who to trust. There are some good guys, though. The story opens with the appointment of a new Chief Commissioner, Duncan, one of the new generation who support ‘the fight against corruption’. Macbeth, at this stage, is head of SWAT. 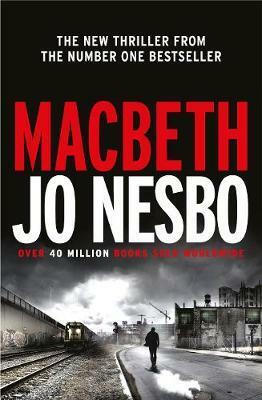 When he and his team swoop in to sort out a drug bust that has gone wrong, Macbeth becomes the hero of the day. Shortly afterwards, Macbeth learns from three prostitutes that he has been appointed as head of Organised Crime. They also predict he will one day rule as Chief Commissioner. Encouraged by his girlfriend, Lady, former prostitute and owner of Inverness Casino, Macbeth sets about removing anyone who stands in the way of his ultimate ambition. As in the original Macbeth, some of the good guys manage to elude him. They plan to overthrow Macbeth and the drug lord, Hecate, and to restore law and order to Inverness. This is a very clever and very readable retelling of Macbeth. It has all the elements of the original play and anyone familiar with it will have a good idea of what’s going to happen next, but not necessarily how it’s going to happen. Whilst I found some of the action scenes confusing, especially at the start, the story had me hooked. It’s a page turner that will appeal to Nesbo and Shakespeare fans alike.